What role? Most of the middle class arrived in that economic neighborhood when working people got together, formed unions, and wrested a fair share of what they produced from their employers. In other words, it was by acting like a working class that most of our families became middle class during the last century. One example is the New Deal, created by a president conscious of the enormous upsurge in unionization and worker activism in the 1930s, consisting of laws such as the National Labor Relations Act, Social Security Act, Unemployment Insurance Act, and Fair Labor Standards Act. While most people think of these as Roosevelt’s legacy, he didn’t do this alone. It took a massive surge of unionization, with workers engaged in strikes, demonstrations, factory seizures, and political action, pushing up from below, before those in power heard their message and created the New Deal. So you might think these historic advances receive the attention they deserve in history books and social studies classes in our schools. But of course they don’t. The title of a 2010 study by scholars working with the Albert Shanker Institute, “American Labor in U.S. History Textbooks: How Labor’s story is distorted in high school history textbooks,” describes part of the problem. The other part is simply exclusion of unions from the story of American society, in the corporate controlled textbook publishing industry and mass commercial media alike. With union density sinking below 7 per cent in the private sector, it shouldn’t be too far a stretch to see the erosion of actual union achievements as related to their erasure from the history books and public conversation. Economic inequality is growing: the highest share of national income since 1928—23%— is in the hands of the richest 1%, at the expense of the rest of us. The Koch brothers, the Waltons, Eli Broad, and their ilk, pick up what amounts (for them) to their pocket change, fallen between the cushions of their couches, and buy elections and politicians across the country to do their bidding. They also spend big bucks to provide curricula with their libertarian, anti-union point of view to schools. These politicians are bent on destroying unions and privatizing every corner of the public sector. All the more important to remember and celebrate the historic victories of the labor movement whatever ways we can. The California Labor Federation and California Federation of Teachers were co-sponsors of AB 2269, and are working with friends in the legislature and the labor movement to disseminate information and instructional materials, and carry out the spirit of the law. 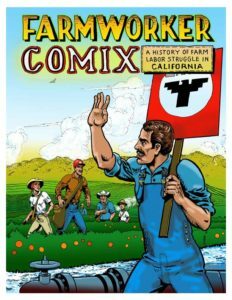 Farmworker Comix: A History of Farm Labor Struggle in California is brand new, just in time for the fiftieth anniversary of the Delano Grape Strike, which resulted in the founding of the United Farm Workers. Written by elementary teacher Bill Morgan, and beautifully illustrated by Zap Comixartist Spain Rodriguez and Jos Sances, the bilingual booklet traces workers’ struggle for dignity in California’s fields from the 19th century through the UFW. 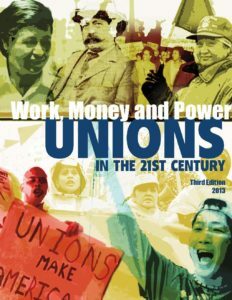 A new updated edition of the award-winning pamphlet, Work, Money and Power: Unions in the 21st Century, is available for high school and up to set the record straight on the continuing importance of unions (including a new translation in Chinese). For a generation of young workers facing employment in big box stores, fast food restaurants, and temp agencies, outside the protections of unions, these lessons are essential if they are to know their rights and know that it’s possible to defend the historic gains of working people. Imagine the difference in outcome of struggles in states like Wisconsin and Michigan over worker rights if young people had had a solid education about the importance of unions in school before growing up and becoming workers and voters. Labor History Month offers an opportunity to give all students something precious: knowledge of where their rights came from, and how to preserve and extend them today.